“I’d like to go with,” I say. “Just another funeral,” I say, stifling a small nervous laugh. Five funerals in six weeks is a record in my world. For the first time I grasp a glimmer of what it must have been like for my brother Tim during the AIDS crisis of the 80’s when deaths of his friends kept coming, warning him of his future. I did. It was the winter my father was diagnosed with lung cancer and died weeks later on Christmas Day. I remember. I looked around the room filled with tables with centerpieces provided by the church ladies. Faces of the grieving are familiar. They reveal the understanding that life will never be the same. 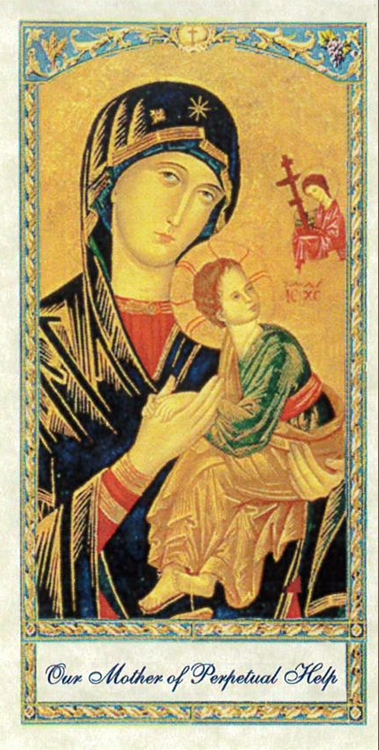 When I returned home from Margaret’s funeral last month, I studied the small card that had her image and a prayer on one side and an ancient image of the Virgin Mary on the other with the words “Our Mother of Perpetual Hope” written below. Hope. When all is lost, hope is the last to leave. It is the most tenacious of all. We lose our money and we have hope we can earn more. We lose our health and we have hope we will heal. If our great love leaves us yet we have hope we will find love again. Winter, even without death, can evoke hopelessness. The overcast days deprive us of sun on our face. The subzero air takes away the sound of a chirping bird. When we go to work in the dark and return home in the dark it’s hard to have hope for a bright new day. I keep Our Mother of Perpetual Hope next to me on the small round table where I sit to coach. It’s where people bring their uncertain futures and dreams along with their grief and goals. My life as a small Catholic girl bowing her chapel veil covered head is far behind me, yet the inspiration to infuse hope to the hopeless remains. Hope is the one guarantee we can give to those seeking solace or possibility. Hope can always be found because, like so much in life, it is a choice. We may not feel hopeful, but we can choose it. When we do, we can see the impermanence of all things, including the deep suffering of any moment. When we choose it, we can see a bigger picture for our lives. When we choose it, we can make a difference in the life of another. At least, I choose to hope so. What are you willing to be hopeful for? Is it possible to hold both grief and hope? How might you infuse hope today?